Dramatic irony occurs when the audience knows something that is going on in a situation but the characters are unaware of what is going on. Because of this understanding, the words and actions of the characters take on a different meaning. This can create intense suspense or humor. Tension develops between what the audience and characters know is happening. A woman thinks her boyfriend is acting strangely because he's about to propose, but the audience knows that he is planning to run away with another woman, intensifying emotions. In a scary movie, the character goes into a house they think is empty, but the audience knows the killer is in the house. This increases the suspense. Sometimes a person is in disguise and the other character talks with him as if he is someone else. Since this is known by the audience, it adds to the humor of the dialogue. In Shakespeare's Romeo and Juliet, the audience knows Juliet is in a drugged sleep, so when Romeo thinks she is dead and kills himself (followed by Juliet doing the same) it increases the audience's shock. In Ibsen's A Doll's House, the audience knows Nora borrowed money forging her father's signature and her husband is unaware. We also know Nora's husband thinks of her as a doll and Nora is unaware. In Shakespeare's Hamlet, we are aware that Hamlet knows the truth about his father's murder and that Hamlet is not mad. He is simply deceiving others so that he can plan his revenge. He does not reveal his true feelings to the other characters but the audience is fully aware of them. 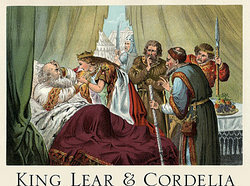 In Shakespeare's King Lear, we know that Lear's most loyal daughter is Cordelia and he can't see it. In the Star Wars movies, Luke does not know Darth Vader is his father until Episode V, but the audience knows sooner. In Shakespeare's Macbeth, the audience knows that Macbeth acts loyal to Duncan while planning his murder. In the TV show Smallville, Clark Kent comments that in the future he does not want to put on a suit and fly around but the audience knows he will. In the movie There's Something About Mary, the audience knows that Ted is being interrogated about a murder but Ted thinks he is being arrested for picking up a hitchhiker. His words are funny because of his misunderstanding. In the movie Toy Story, Buzz Lightyear thinks he is a real space ranger but the other toys and the audience knows that he is just a toy. Hank Schrader in Breaking Bad is a DEA agent looking for crystal-meth producer "Heisenberg". We know that "Heisenberg" is Schrader's brother-in-law, Walter White, while Hank has no idea. In Beauty and the Beast, the audience knows that the Beast is a prince living under a curse from the start but Belle is unaware of the Beast's true identity. In Frozen, the audience is aware that Elsa has powers that are hard to control. Her sister Anna does not know about these powers and thinks of Elsa as standoffish and cold. The truth is that Elsa is being distant from Anna to protect her and is scared of hurting her. The audience feels for both girls. "The audience is longing to warn the characters on the screen: 'You shouldn't be talking about such trivial matters. There's a bomb beneath you and it's about to explode!'" The shower scene in Psycho starts out with the character, Marion, not hearing the killer because the water is running in the shower, but the audience knows he is there. Marion was clueless that she was about to be murdered which increase tension for the audience. In The Birds, Melanie is seen walking up to the attic that has been closed off. She is unaware that this room is filled with the birds, while the audience knows they're there. She places her hand on the doorknob and hesitates before entering, giving the audience a moment of hope that she won't be attacked by the birds. In Rope, the audience sees the murder at the beginning of the movie. The audience knows that David has been killed and that his body is hidden in the chest being used as a table. The characters are waiting for David to arrive when the audience knows he will not be arriving. This fact adds to the humor in this movie in an ironic way. In North by Northwest, George Kaplan is a fictional secret agent and does not really exist. The audience is made aware early in the film that Kaplan is just a decoy. Thornhill is seen searching for Kaplan and has no clue that he is not a real person. Dramatic irony exists when the audience knows information that the main characters do not. Since the audience is aware of something that the characters are not, tension builds, creating suspense, and even comedy, throughout a film, book, or play. The writer uses this technique intentionally to keep the audience engrossed and engaged while watching what is on the screen or stage. For examples of the different types of irony, check out Examples of Irony. "Dramatic Irony Examples." YourDictionary, n.d. Web. 18 April 2019. <https://examples.yourdictionary.com/dramatic-irony-examples.html>.